This thing is made of electroplated Britannia metal (the heavy stuff that Oscars are made of – but those are gold plated of course). 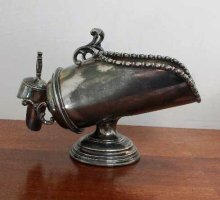 Our scuttle was once silver plated but it has largely worn off. Still it is a a charming thing and it looked great filled with chocolate buttons, however sadly we ate them before the camera person arrived. The scoop is intact and fits neatly into the back handle…. This should at least postpone its loss.